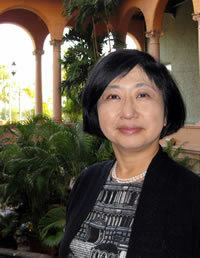 As I return from my research sabbatical, and as the Center prepares for “Taking Flight: The Year of the Humanities and the Arts,” I thank Anne J. Cruz, Professor of Spanish in the Department of Modern Languages and Literatures, for her able stewardship of the Center and its programs during 2011-12. Throughout the academic year, the Center marked the 500th anniversary of Ponce de León’s arrival to Florida with a series of events around our February conference, “Florida at the Crossroads: 500 Years of Encounters, Conflicts, and Exchanges,” which was organized by Anne Cruz and Viviana Díaz-Balsera, Professor of Spanish. During fall semester, the Center sponsored three workshops for Miami-Dade teachers and a poster and essay contest for area middle schools. Supported by a generous grant from the Florida Humanities Council, the three-day conference hosted 27 speakers from Florida, US, and Spain, drawing close to 1000 attendees. The conference ended with a play by 17th-century colonial Mexican poet Sor Juana Inés de la Cruz, presented by the Center, GablesStage, and the School of Music’s Frost Chorale. In addition, the Center welcomed three Stanford Distinguished Professors: Miami’s premier Latino playwright, Nilo Cruz; professor of Philosophy and scholar of visual media Dominic McIver Lopes, and physicist and prize-winning novelist Alan Lightman. These presentations attracted not only a large number of faculty and students from the UM community, but also audiences from the greater community of South Florida. January will bring Temple Grandin, Professor of Animal Science at Colorado State University -- named in 2010 one of “Time’s 100 Most Influential People of the Year,” author of Thinking in Pictures and Animals in Translation, and subject of the film Temple Grandin starring Claire Danes -- will speak on “Different Kinds of Minds,” concerning her experiences with autism. In February, Mary Garrard, Professor Emerita of Art History at American University -- a pioneering feminist scholar who rediscovered Artemesia Gentileschi, now considered a major woman artist of the Italian Renaissance -- will present a lecture based on her recent book, Brunelleschi’s Egg: Nature, Art and Gender in Renaissance Italy. This lecture, open to the public, will be a keynote for Early Modern Women: New Perspectives, a Medieval, Renaissance and Baroque Conference organized by the Department of Modern Languages and Literatures and supported by the Center, to celebrate the first issue of Early Modern Women: An Interdisciplinary Journal produced by the new editorial team under the Center’s auspices. In March, prize-winning novelist Amitav Ghosh will give two lectures on “China and the Making of Modern India” and “Speaking of Babel: The Risks and Rewards of Writing about Polyglot Worlds.” The latter will be the keynote speech for “Language and Democracy,” a conference jointly organized by the Center and the School of Law, to explore existing and possible relations between linguistic pluralism and democratic governance in diverse geographic, national, and historical contexts. We hope that you will join us for these many exciting events as we celebrate the Year of the Humanities and the Arts.